Welcome to the Gender Odyssey Spotlight! As we approach Gender Odyssey Professional Los Angeles (June 28-29) and Gender Odyssey Seattle (August 23-27) conferences, we are using our blog to spotlight some of the presenters, sponsors, and attendees of these conferences. We hope these interviews will illuminate how Gender Odyssey is not only speaking to the issues central to transgender and gender-diverse people today, but making a difference in the lives of those who participate. riKu Matsuda works in the Human Relations Branch of the LA County Workforce Development, Aging and Community Services Department as a Senior Intergroup Relations Specialist. He is an analyst for the annual hate crime report and leads the department’s work to end violence against transgender and non-binary communities. riKu also coaches for the Groundswell Foundation’s Grassroots Organizing Institute and hosts a public affairs program called “Flip the Script” on Pacifica’s KPFK 90.7FM Los Angeles. Gender Odyssey: Tell us about your background working with the transgender and gender-diverse community. riKu: I started organizing in LA’s trans community shortly after I came out as trans in 2001. As a youth organizer at a nonprofit in Long Beach, I became very active in California’s youth movement protesting Prop 21 and other anti-youth initiatives. The absence of LGBTQ youth projects and organizations was deeply felt so we started qteam, an organization by and for radical queer and trans youth of color in LA. When I aged out of qteam at 26, I served on the governing board of FTM Alliance of Los Angeles (now Gender Justice LA) and became active in organizing Trans Unity Pride LA (now Trans Pride LA). For a decade and change, I’ve been working for the LA County Commission on Human Relations to end hate violence and discrimination against trans and non-binary folks in LA County. GO: What will you be presenting on at Gender Odyssey Professional LA? riKu: I’m presenting on my work at the County of Los Angeles Commission on Human Relations. In April 2016, after North Carolina’s former Governor Pat McCrory signed HB2 into law, the Los Angeles County Board of Supervisors passed a motion to boycott travel to and business with the state. The motion called for a scan of LA County policies to ensure gender non-discrimination, implementation of AB 1732 (California’s All-Gender Restroom Law) and research to identify “gaps” in serving non-binary and transgender folks. I’ll be sharing anecdotes, bumps in the road, small wins, and a call to action to make LA County a more livable place for non-binary and trans folks in 2017 and beyond! GO: What do you want attendees of your presentation to come away with? 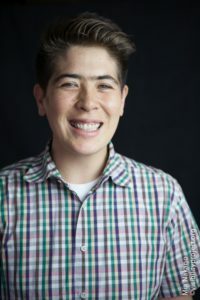 riKu: I’d like folks to walk away with a sense of urgency and an action plan to make our communities safer and more livable for non-binary and trans people. GO: In a climate of unprecedented visibility and new challenges confronting our community, what makes your topic particularly relevant? riKu: I’ll be sharing how “trans visibility” has affected my work in the County with emphasis on news and entertainment media of 2016. GO: What do you hope to get out of this year’s conference? riKu: I’m very excited to experience fun workshops and hear speakers that I adore! I hope to take away new information and strategies that I can apply to my work/organizing. And I hope to make new movement friendships and pick up some cool buttons, stickers, and a tote bag or two.